The rotunda was erected to commemorate those who served in World War One. It is constructed of concrete with eight classical columns support a frieze surmounted by a domed roof. On the roof are the names of the theatres of World War One - Gallipoli, France, Cocos Islands, Egypt, New Guinea, Sinai and Belgium. 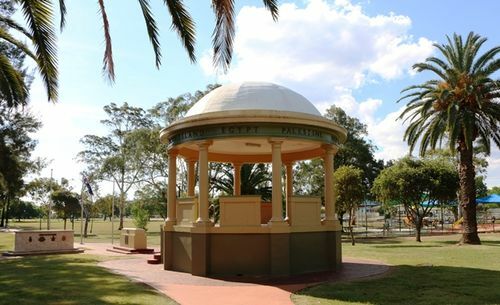 The original foundation stone in the Memorial Park Rotunda was laid on ANZAC Day 1922 by Sergeant Norman Booth who at the time was both a serving member of the Australian Army and the RSL sub-branch president. At a meeting of the sub-committee on the 21st May 1932, it was decided to unveil the memorial on the 29th June. The Home Secretary was approached to gazette a half-day holiday throughout the Shire. The Memorial Rotunda was unveiled by Major-General Sir William Glasgow on the 29th June 1932. The Brisbane Courier, 27th June 1932.